The Hall of Gods is a progressive jackpot slot that reaches the same amounts as Mega Fortune. It has 5 reels and 20 pay-lines and is based on a Norse mythology theme featuring characters such as Thor the God of Thunder. The game has 3 tiers of jackpots, the Mini, Midi and Mega jackpot all of which can be won during the Hall of Gods Bonus Feature which is triggered by 3 or more Hammer and Shield bonus symbols. 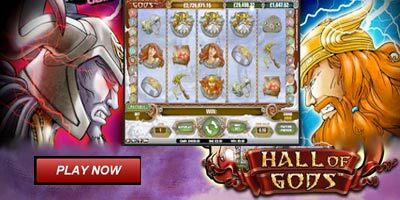 Hall of Gods™ is a 5-reel, 3-row video slot featuring Free spins, expanding Wild substitutions, scatter wins, and a bonus game with 3 progressive jackpots. You can play 20 betlines at different bet levels. The spin button plays the game at the current coin value and bet level. Wild symbol on reels 2, 3 or 4 expands to cover the entire reel when a winning bet line is present. Bet lines win if the winning symbols are in succession from the leftmost reel to right. 3+ scatters activate Free spins. In Free spins, 3 or more scatter symbols activate additional Free spins. The multiplier is x3 during Free spins. The multiplier does not apply to bonus game winnings. 1 of 3 Jackpots can be won in the bonus game! The more you bet, the greater the chance to win a Jackpot! 3 bonus symbols activates the bonus game. Click the shields to reveal jackpot symbols or coin amounts. Match 3 Mini, Midi or Mega Jackpot symbols to win the corresponding jackpot amount. Alternatively, you can match 3 coin values and win the matching amount. The Jackpot is a progressive jackpot, where every time an optional jackpot bet is made a portion of the jackpot bet is added to the jackpot. Jackpot values displayed in the game are delayed by up to 30 seconds. On exceptionally rare occasions, it may happen that the jackpot is won by another player during those 30 seconds, in which case the win is the new re-seeded jackpot which may be smaller. However, in most cases the 30 second delay results in a higher jackpot win value. The Jackpot counter might be displayed in a currency other than that you are playing in. If you win a Jackpot and are playing casino games with a different currency, the amount won is converted to the currency in which you are playing and is added to your account. The Casino Operator and the Software Supplier reserve the right to change or waive the Jackpot rules at any time and for any period. "Hall of Gods video slot * How To Play * Demo * Free Spins"